Ponds have a magical ability to calm us down; any form of discomfort such as stress could be easily curtailed. Since our bodies are mostly made of water, the water in the pond can provide this similar feeling. By creating a relaxing ambiance, water provides a comfortable and life-giving mood. Life typically depends on the existence of water thus a water resource within our compounds is consequently important. If you are thinking of installing a pond on your property, one of the common decisions you have to make is to choose between above ground pools vs. below ground pools. Let’s find out how they differ. As its name suggests, this type of ponds is built above the ground. Above ground ponds can sometimes be referred to as water gardens or koi ponds and more. Their measurements are usually in gallons, and mostly a liner is used to hold the water. Though there is no precise name for this, a closed system could be a better term to use. It is virtually similar to an aboveground swimming pool due to the installation of a liner and a pump to aid in water rotation. Advantages of having above ground ponds include the ease of taking care of your pond without you having to lean over that much. Also, if you are thinking of moving to a new home in the future, having an above ground pond will certainly make things easier. Many people also shared that above ground ponds are easier to maintain. 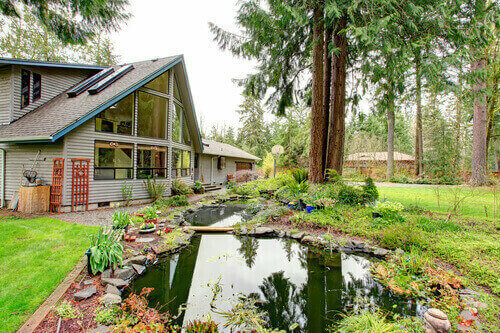 Seemingly, above ground ponds are cheaper to construct too. On the other hand, some people will argue that a below ground pond will look more natural than an above ground pond. Below ground ponds are measured in square feet or acres and include tanks, farm ponds, reservoirs, and pools. From the watershed, the springs or the wells, water naturally flows to the ponds. Better clay content is essential during construction as it prevents seepage of water hence minimum water loss. This will also reduce the cost of using a liner. One of the key pros of having below ground ponds (also known as in ground ponds) is that you can have longer depths and provide more space for your aquatic animals, plants, and so on. Of course, one of the major setbacks is that you have to check local building and safety regulations whether the location site you have chosen for your below ground pond is viable. The other issue is if you need to move out of your property, you cannot take your pond with you. All in all, it’s up to individual preferences when it comes to the type of pond to construct but based on our years of experience, above ground ponds do enjoy higher popularity in recent decades than their below ground counterparts. Talk to us if you need more advice on choose the right type of pond to construct.